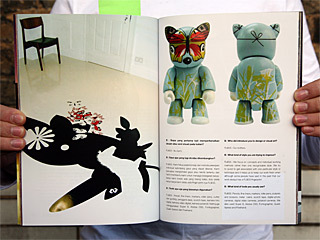 Indonesian magazine Babyboss is featuring cutting edge trends in illustration, experimental design and urban art. They kindly invited us prior to its launch to take part in an interview and excerpts were published in this issue as part of a 12-page FL@33 profile. 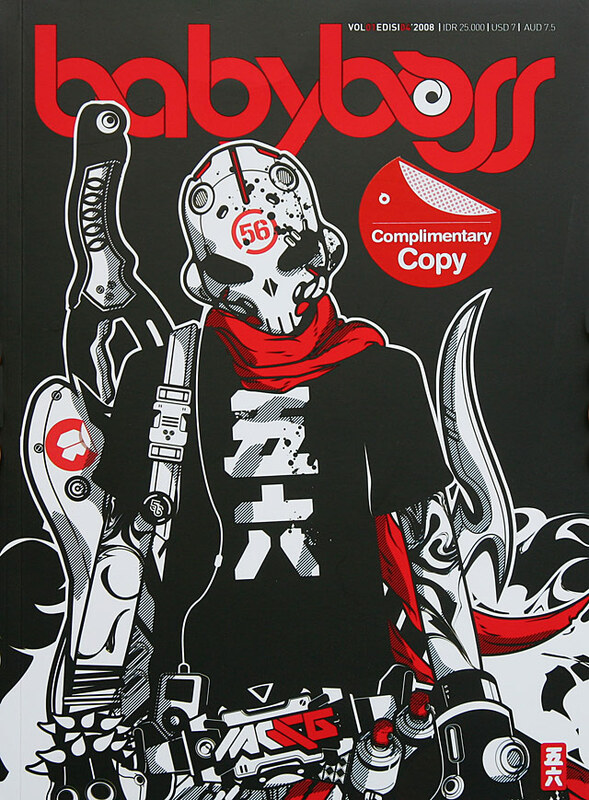 Babyboss is a bi-lingual publication, Indonesian and English. |1| Tell me a little bit about yourself and your life, include your academic background? FL@33 is a multi-lingual and multi-specialised studio for visual communication based in London. Founders Agathe Jacquillat (French from Paris; Academy Julian, ESAG) and Tomi Vollauschek (Austrian, originally from Frankfurt, Germany; FH Darmstadt) met on the Royal College of Art's (RCA) postgraduate Communication Art and Design course in 1999 and set up their company in Notting Hill after graduating in July 2001. ___ The studio is working across all media in the areas Concept Generation, Print, Screenbased Work (Broadcast, Motion Graphics, Interface Design, Websites), Exhibition Design and Publishing. FL@33s’ mission is to create a professional, vibrant, fresh and artistic body of work while keeping a balance between commissioned and self-initiated projects and publications. FL@33's work philosophy is based on the 'Power of 3' theory – the balance of intellect, skill and emotion. Projects have been featured online and in numerous magazines, newspapers, books around the world. ___ Award-winning projects include: Architecture, Art and Design publication Trans-form, Pencil Sculpture Illustration Series (Creative Review cover 11/2002, Eye and Butterfly Pencil Sculptures), FL@33's amusing sound-collection bzzzpeek.com, AAT - Animated, Acoustic Typefaces and the animation Singing Pasta or Eat and Be Eaten. __ In October 2004 FL@33 launched stereohype.com - graphic art and fashion boutique. Stereohype.com is an online boutique offering limited editions and rare products. The stereohype range is focusing on fresh, innovative and inspirational works and expands regularly. 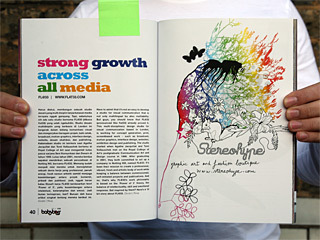 Products include exclusively commissioned artworks for stereohype. Stereohype.com is a platform for designers and artists around the world. ...mailing list, international magazines and link portals. 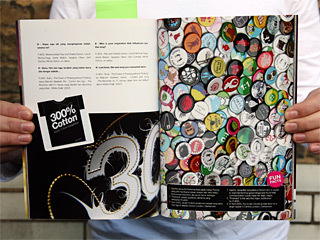 The Stereohype range includes the growing and popular button badge collection with its annually added design competition winners and the frequently added B.I.O. (by invitation only) button badge series. April 2005 saw the studio move across town to a much larger space in Central London, Clerkenwell. To mark this new era a FL@33 monograph was published in May 2005 as part of the highly collectable 'design&designer' series by French Pyramyd Editions (bi-lingual: English and French; book collection number 33!). ___ Postcard is the very first major publication conceived, compiled, written and designed by Agathe Jacquillat and Tomi Vollauschek at FL@33. The book features on 224 pages over 800 hand-picked postcards and postcard-related projects by over 130 artists, illustrators, photographers, designers, studios and collectives from all around the world, with emerging talents sitting alongside established artists. The English edition of Postcard will be released in September 2008 by Laurence King Publishing in the UK and by Chronicle Books in the USA. At the same time several foreign language editions will also be released by their international partner publishers (French, Pyramyd Editions, German, DuMont – Literatur and Kunstverlag and in Spanish by Gustavo Gili). |2| Since when are you interested in design, visual arts, drawing and illustration etc? Tomi (T): Thanks to my Mum I took adult drawing classes at the age of 9 and loved to get my hands dirty while creating something on paper. |3| Who /what did introduce you to design / visual art / drawing / illustration / so on? A + T: In both cases our mothers. |4| What's your style and why did you choose to improve it? FL@33 is working in many different areas of visual communication and we therefore focus on concepts and individual working methods rather than one recognizable style. We find it helps to keep our work fresh when we try to avoid to get associated with one particular style or technique although some people have said in the past that our work always has a FL@33 fingerprint. |5| In general, what's your inspiration? |6| What tools do you usually use for your creative work? A + T: Pencils, fine-liners, markers, roller pens, scalpels and scissors, rulers – preferably metal ones, Scotch tape, digital photo cameras, digital video cameras, sometimes Polaroid cameras and we also used lots of super 8 in the past, Adobe CS suites, Fontographer, and due to old habits Quark Xpress and Freehand. |7| Visual arts is a growing industry nowadays... Could you tell us when and how could you get involved in this industry? A: We are quite often commissioned to create artistic work or graphic art – however you want to call it. Good examples are for instance commissioned exhibits like the motion graphics we created for companies or exhibitions such as Valencia Bienal / Alsop Architects, GraficEurope conference / RotoVision, Sacla or Altran, beside others. Very experimental works without briefs (other than a starting point such as the medium itself for instance or a general theme). This probably happens because we are regularly working on very free, self-initiated projects which are often made public on flat33.com and/or in books and magazines. |8| Name of clients you've worked with... International clients are from Great Britain, France, Germany, Italy, Spain, Hong Kong and the USA and include MTV Networks / VH1 European, Friends of the Earth, Barbican & Young Vic theatre, Laurence King Publishing, Creative Review, Computer Arts, Royal Festival Hall, Sacla, BBC, Matelsom, Alsop Architects/Valencia Biennale 2003, RotoVision / GraficEurope conference 2004, Pyramyd Editions, The Creator Studio / Torraspapel, Ecole Normale de Musique de Paris, Altran, Arts Affaires, BlackBook magazine and Groupe Galeries Lafayette, besides others. ...eight months or so after we set up FL@33 – to create three seasonal Brochure covers and images for posters, brochure dividers and leaflet covers for the Royal Festival Hall Classical Music campaign 2002/03. Their Art Director of the in-house design studio saw our self-initiated, self-published Architecture, Art and Design publication Trans-form magazine. ___ Trans-form is a multi-media celebration with a large scale magazine, an attached cd-rom 'trans-it' and the website trans-port.org. Trans-form celebrates the beauty of tower cranes which appear and disappear in our cities. We treated the tower cranes as pieces of art, sculptures really. We interviewed crane operators 30 metres above ground (with our heads in the sky) and created and animated crawling cityscape insects with tower crane legs. The publication includes photography, photo-montages, line drawings, typography, animations and lots of information on how tower cranes work, etc. ___ So all this was presented by the Royal Festival Hall's Art Director to their marketing department who needed to be convinced that people who can make tower cranes look exciting and beautiful could do the same to promote classical music... We were really excited about this commission. Not only did a big client approach us for the first time because they saw another FL@33 project but we could also work in a way we wanted to. ___ Agathe and I were responsible for taking pictures of bizarre medieval instruments with real-time explanations by their owner, all kinds of musicians in action and the design itself - the creation of surreal, intriguing and inviting imagery. The images were – as already mentioned above – created in a ping-pong fashion were Agathe would start a composition, I would then add elements and Agathe would finish it after a few back-and-forths - or the other way around. |10| What are some of the things that you do to keep yourself creative? T: Agathe and I regularly collaborate with book / magazine publishers and designers around the world if we find a particular subject intriguing. Self-initiated and/or non-commercial projects have therefore always played an important role and generally inform our commissioned work. |11| Who is your idol inspiration that influences you this long? Book: Blink – The Power of Thinking without Thinking by Malcolm Gladwell, the follow-up from the equally fascinating The Tipping Point. Reading it for a months now and hope to find time to finally finish it soon. Music: PJ Harvey The Mountain from her brilliant album White Chalk (2007). |13| What are things that you (love/hate) about your country? A: My German is quite frankly catastrophic - so Berlin for instance is currently out of the question and Tomi's French is not good enough yet to even think about moving to Paris. Our common language is English, London is where we met and set up our studio and we simply love to live and work in this multi-cultural, vibrant metropolis. We found plenty of delicatessen shops around town to cover our needs for 'food from home'. It's very sad of course that we both had to leave so many old friends and our families behind. They hopefully come quite often and visit us and we can leave the island quite easily too and reach mainland europe within a few hours via Eurostar (as train passenger), Eurotunnel (train by car), plane or theoretically using fairies. |14| If you transform as a colour, what do you want to be and why? A: I know not really a colour as such but it's white. |15| Imagine your 20-years-to-come life, what do you see? T: 20 years is of course impossible to predict. 5 years are difficult enough. Anyway – we will probably continue for some time to create books with our trusted publisher Laurence King. We are aiming to expand FL@33 while maintaining a healthy balance of work across all media. We simply love to be able to satisfy our clients (and our own) needs to provide them with the full package including visual identities, books and posters, T-shirts, badges and postcards, installations, websites and animations, etc. 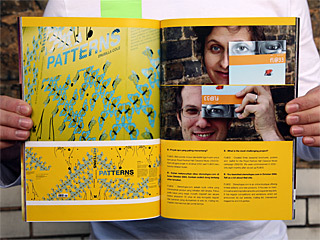 Anything really from custom typefaces to art directing publications. Since all this is our passion we will probably still be doing this in many years to come. |16| If you could reincarnate, who or what do you want to be? T: We are doing just fine as humans, male and female respectively. |17| What will you say if you meet someone who plagiarized your artwork(s)? T: Ignorance, pessimism, juicy raisins.